The world we know is gone. It’s fallen into the hands of an invading alien force, and humanity is holding on by only a thin thread of hope. There are few brave enough, skilled enough, and foolhardy enough to take on this mission. If Project: ELITE fails, we all go down with it. This sets the stage for one of the most exciting, innovative, and at times, stressful games in recent memory. 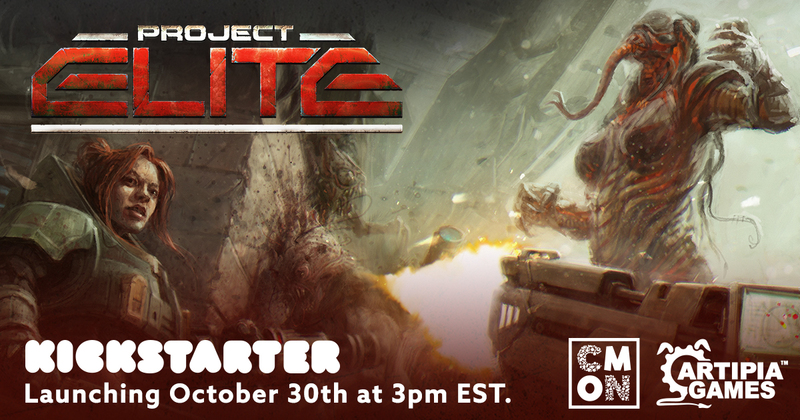 Project: ELITE made a huge impact when it first hit Kickstarter in 2016. With its cooperative missions and real-time game action, players were thrust into a tense battle for survival with the entire human race hanging in the balance. Due to the real-time mechanics of the game, both Tsantilas and Kokkinis faced some interesting design challenges unique to this style of game. Despite being a game that relies heavily on a frantic, speedy mechanic, the designers didn’t want to leave out the theme. Project: ELITE is a game with a rich backstory and an almost cinematic feel to its presentation. They drew upon their love of science fiction movies and books to create the world the game is played in. A huge factor in transporting players into this world was the new high-quality art and miniatures that are an expected element from any CMON title. Making players feel like they were in the middle of a desperate situation was a top priority for everyone on the project. “Playing Project: ELITE feels like you're playing a video game or starring in a movie. The art and the miniatures play a very important role in the player's immersion,” said Tsantilas. A constant theme throughout Project: ELITE is teamwork. You need to have it to survive different missions, and it was crucial in the design process as well. Just like the design process, the missions in Project: ELITE are going to test the synergy level of your team. Players familiar with the original edition will be happy to know that they are able to experience the same game as before. However, the CMON edition comes with some exciting new elements that will be revealed as the Kickstarter campaign continues. Project: ELITE is all about coming together as a team to get the job done. From the original design partnership between Tsantilos and Kokkinis, to the work Artipia Games and CMON have done to update the game, to the teamwork you’re going to have to display to win a mission and keep hope alive for another day. You can choose to fight together as a unit, or die alone. The choice, and the fate of the world is up to you. Read the Project: ELITE overview article here. Read the Project: ELITE Heroes article here. Read the Project: ELITE Aliens article here.